Another wonderful time with the seniors at Eagle Park. Many thanks to Louise at Eagle Park for helping us organize this get together. Another fun visit to Eagle Park! We were so thankful to Eagle Park for including all of the QCEWS kids to this event. A memorable and magical afternoon at Eagle Park Lodge. Seniors, adults and children worked together to create Christmas lanterns. A sing song followed and THEN a very special visitor entered the room. Merry Ho! Ho! Children, adults and seniors gathered together on Halloween at Eagle Park Lodge in Qualicum Beach. A story was read by a joyous witch; the story transformed to a song format where all present joined in chorus to celebrate traditional storybook characters presence at the Halloween Ball. Lots of dancing and singing was going on at the Halloween ball. We are most grateful to the staff at Eagle Park for hosting the QCEWS Kids. Relationships continue to be developed. We are grateful to the retired teachers who came to honour and value the seniors and children having fun together. The Intergenerational Table is a platform for developing quality relationships in our community. Come join us!!! We value your presence. We will be singing Christmas carols at the senior facilities during the month of December. Stay tuned! Most of us older people know already how delightful and fulfilling it is to be with our grandchildren. It seems fair to to ask “What is the magic ingredient that connects the old and the young when there is no blood relationship?” A very good example of this 'joining' happened on June 1st at the Eagle Park Care facility. This date was chosen because it was Intergenerational Day across Canada. 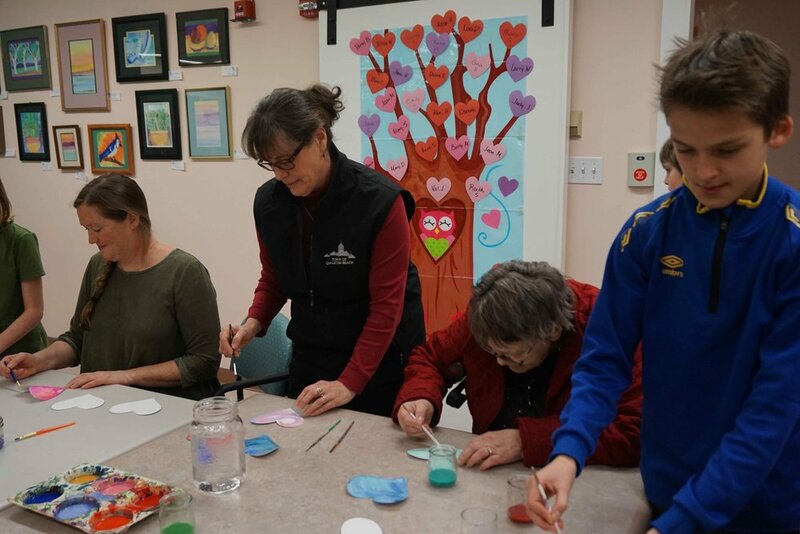 The intent was to recognize the importance in our society (social lives) to mix, mingle and generally get to know each other – and recognize that, regardless of age, there are thoughts and activities that allow us to come together. At the Eagle Park event some members form the QB Seniors' Centre came to join with some of the residents and a very joyful bunch of younger students, their parents, and ex-teachers. They quickly combined to tackle a big project. This involved facing some bland looking rocks who were obviously longing to be painted and given personalities. It turned out to be a happy and successful time with people squeezing in between each other to add advice or an extra dab of paint. The help of the staff and an ample supply of paints and brushes contributed to the success. An earlier meeting of the generations took place at the Seniors' Centre and was equally enjoyable. It is possible that the cookies and juice and games played a part, but the interest and sincerity was apparent. The June 1st meeting of the generations took place under the auspices of the Qualicum Community Education & Wellness Society. QCEWS(acronym) is becoming known in our local areas as a group which can bring together the talents, energy and ideas available to grow and enhance services in wellness and education. As part of this approach, the intergenerational aspect is just one of its programs. Others underway include the “Root Bag” program in the elementary schools and working toward expanding food production / food security in the community. The directors of the QCEWS would very much like to welcome new members who can bring their energy and ideas to help us enrich our neighbourhood resources.